Before I get to the knitting, just a few little things. 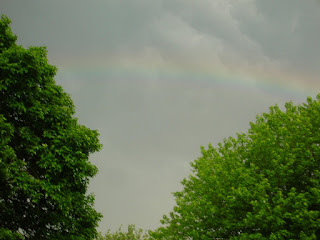 Can you see the faint but beautiful rainbow? This was last week. Right across the street from our house! Ok - now for the knitting - another baby hat using remnants of Lorna's Laces. 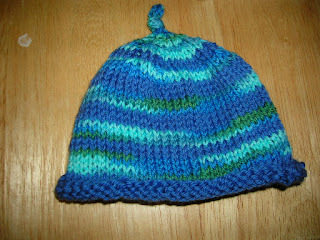 It's knit on size 8 needles, which gives it a very loose weave, but I think it's good for Summer babies. This will go to the Ronald McDonald House via my friend Gerry. :-) She gave me a picture Friday of one of the little babies wearing one of the hats I made - very sweet! 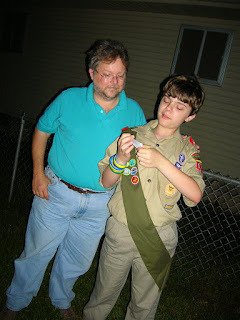 Here is Simon with Mike after the Court of Honor at Scouts on Monday. He advanced 2 ranks (up to First Class, now!) and received one new badge. Yay! It was fun to go see the ceremony and watch all the kids get their things. I like the boy-run atmosphere. It's good to see boys taking leadership seriously. Oooo...the socks look lovely. Don't you just love self-striping yarn? Love the knitting and rainbow! As soon as I finish this shawl I've been knitting on for the past couple months, I'm doing some socks and some hats also. I saw some cute ones on Knitty Gritty I want to try out. 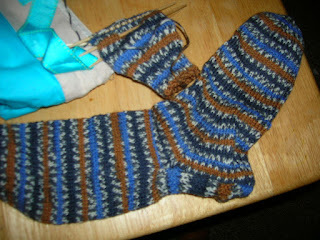 I do love self-striping yarn! (especially when gifted by such a sweet friend!) I'm making a bad now from Noro Kureyon. I wish I could afford to make a whole jacket from this stuff! Of course, it would be the scratchiest jacket on the planet, but boy would it look cool! Gwen, darling - could you give me your email addy . . . and could you post on your blog again?